As you might have caught on I was not happy at my last barn. Things went sour a few weeks ago and they went sour fast. I'll work on a "Why We Moved" post eventually but for now just understand that I had to move for Cupid's health and my sanity. We moved closer to my mom's house, which is still a 45 minute drive for me, but I couldn't have asked for better facilities. Despite only being here for a few days I've got a great feeling about this place! Our moving day was Thursday. I stopped at Winter Garden Feed Co. on the way to the barn so I could pick up Cupid's current feed. She is currently on Nutrena ProForce Fuel and will be switched to Seminole Wellness Perform Safe. In order to ensure she has the correct food at the new barn I decided to be the one to pick up the feed, which also allowed me to get a new Jolly Ball and a Redmond Rock. From the feed store I went to the, now former, barn. My plan was to ride Cupid one more time at a familiar place, give her a bath, then pack all my stuff. We were able to get our ride in, but the bath was a slight disaster. One of the other boarders at former barn had her horse grazing on the grass outside the barn and something about that freaked Cupid out. She once again took out the was stall wall (which has never been properly installed or repaired), effectively ending our bath. Once she calmed down, I had her stand quietly in the wash stall then took her to the hose outside to rinse the conditioner out of her tail. I allowed her to graze and prance around her turnout field until the new trainer called to let me know she was on her way. The new trainer was kind enough to come pick Cupid up and had been informed that Cupid is extremely bad about trailers. I have never been allowed to load her myself or seen her loaded without a fight. In the weeks leading up to this move I had worked on a lot of ground work with the hope that she would be a bit better about loading. When the trailer got to former barn I was informed that I would be expected to load Cupid. Needless to say, I was a bit freaked out that something would happen to her. Cupid loaded like a champ! She followed me slowly up the ramp and stopped at the top, I let her evaluate the trailer and think about what I was asking. Once I felt like she was comfortable with the idea, I asked her to follow me into the trailer itself. To my surprise she listened and let herself get clipped in and the dividers shut! With that, lack of dramatics, we were off to the new location! 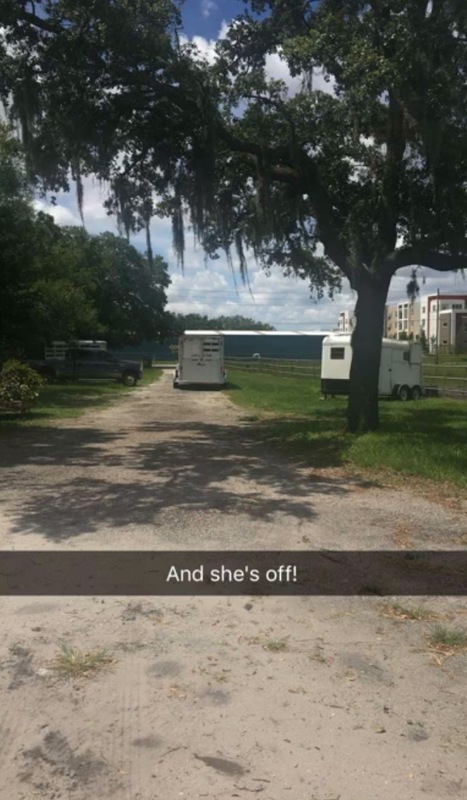 The whole drive to the new barn I panicked about everything that could go wrong. Cupid might be a bull getting off the trailer, she could bite someone, I might appear completely stupid, the barn could be worse than the last place, we might get asked to leave, and finally, this could be a complete success and I would feel stupid for second guessing everything. The trailer beat me to the new barn and I dashed to it to help, thinking that Cupid was being a complete jerk which is why she wasn't unloaded. Nope, she was nervous and pawing, but the trainer explained we were going to wait to unload her until she stopped since she wasn't scared just being impatient. The went on for 15 minutes with us verbally praising her every time she stopped. When she stood for a full minute without pawing I was given permission to start opening the dividers to get her off. With each divider we did have to stop for a minute but she picked up quickly that standing quietly would get me to move quicker. Finally, she was untied, all the dividers were down, and I was holding her expecting her to bolt off. She calmly looked me in the eye and if she could talk she would have called me an idiot for thinking she's a monster. We slowly walked off the trailer and she got all the cookies I had in my pockets, tons of praise, and a well deserved grazing/exploring session while I explained her history to the new barn owner. As we spoke the barn owner walked me through how her integration into the herd would go. Cupid's stall is located in a shed row of 4 stalls that is located in the center of a paddock. The other three horses would be stalled during the day while Cupid is allowed to roam, then Cupid will be stalled at night while the others have turnout time. This will allow all the horses to get to know her on everyone's terms and at a comfortable pace. Eventually we'll start adding the horses into turnout with her one by one until all four horses can be left out together. Because we arrived during the day Cupid was released into the paddock and quickly started visiting with the other horses. 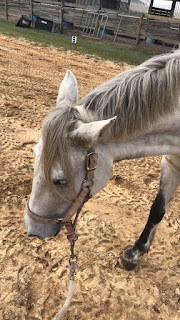 She had a whole "squeal and pinned ears" moment with the other mare, but there were no dramatics with either of the geldings in her group. I stuck around the barn for about 3 hours just watching her and making sure she was settling in properly. Eventually my mom started texting me that I needed to leave the horse alone and take a break so I headed to her house to take advantage of the pool. I returned to the stable that night for about an hour just to do one final check on Cupid. All the horses were stalled for dinner so we were all able to go visit with her. She didn't seem too thrilled with the bran mash she was provided but I was informed later that she had finished it all before the girl doing barn chores came back to turn the others out. Cupid appeared relaxed and was her usual lippy self, trying to see if there were treats in our pockets or if she was able to get a good scratching from us. Overall, I've been really happy with our move and am excited to see how the rest of our adjustment goes! My only regrets with this move are that I completely underestimated how good Cupid actually is and that we didn't move earlier. I had looked at this barn months ago but backed out because I wanted things to get better at the old place.